On February 2-4, 2016, staff from the Auschwitz Institute for Peace and Reconciliation and alumni of its Raphael Lemkin Seminar for Genocide Prevention attended the Second International Meeting of Global Action Against Mass Atrocity Crimes (GAAMAC). 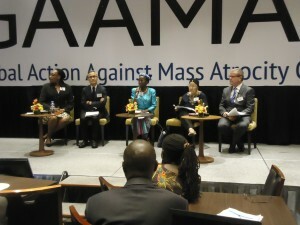 The event, entitled “Preventing Atrocities by Strengthening National Atrocity Prevention Architecture”, took place in Manila, Philippines. GAAMAC is an inclusive, state-led network created by states and civil society organizations joining together to engage in atrocity prevention. 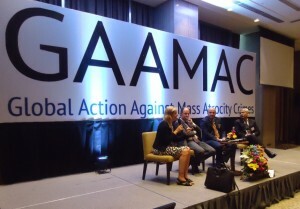 Founded in 2013, GAAMAC functions as a platform for exchange, dialogue, and the dissemination of learning and good practice in the prevention of atrocities. 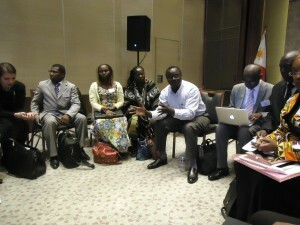 A diverse cadre of AIPR alumni attended the event, including numerous representatives from government bodies in Latin America and Africa. Luciana Peres of the Brazilian Secretariat of Human Rights and Andrei Serbin Pont, Regional Coordinator of Economic and Social Research at CRIES and instructor at the November 2014 Raphael Lemkin Seminar for the Latin American Network, led a workshop titled “Successes, challenges and dilemmas, lessons learned, needs and proposed action steps in supporting the development of national atrocity prevention architectures”, while Maria Gabriela Quinteros, Deputy Director of the Department of Human Rights of the Ministry of Foreign Affairs of Argentina was responsible for leading a plenary session on “Strengthening national architectures of atrocity prevention: key building blocks of national prevention architectures”. The Director of AIPR’s Africa Programs, Dr. Ashad Sentongo, attended the event and helped lead a workshop titled “Sub-regional initiatives as a support to national architectures.” He was joined at the event by Lady Justice Jamila Mohammed, Judge of Appeal within Kenya’s national Court of Appeal and Chairperson of Kenya’s National Committee on the Prevention of Genocide, Lina Zedriga Waru Abuku, Secretary of Uganda’s National Committee for the Prevention and Punishment of the Crime of Genocide, War Crimes, Crimes Against Humanity and All Forms of Discrimination, Ambassador Liberata Mulamula, Permanent Secretary at the Tanzanian Ministry of Foreign Affairs and International Co-operation, and Rev. Thomas Godda, Executive Director of the Inter-Religious Council for Peace, Tanzania. The United Nations Office of the Special Advisers on the Prevention of Genocide and the Responsibility to Protect (OSAPG) was also well represented at the event. Both Special Advisers participated in the event, with Adam Dieng leading a plenary discussion titled “Preventing mass atrocities: what exists, what have we learned, what do we need?” and giving remarks during the closing ceremony while Jennifer Welsh appeared via digital video link to lead a discussion titled “Developing early detection capacity as a critical element in the prevention of atrocities”. Claudia Diaz, Human Rights Officer at the OSAPG, led two workshops during the event titled “Early warning assessment tools and the UN Framework of Analysis for Atrocity Crimes” and “Building capacity in the security sector to prevent atrocity crimes”. The views and opinions expressed by delegates demonstrated an increasing resolve across the prevention and RtoP community to act together to stop mass atrocities, more particularly in ways that can produce enduring stability and long term peace in both vulnerable and victim societies.